Once we decided that we were going to have laying hens for eggs, we had to get them. We had to wait until after our Spring Break trip to get the chicks as we didn’t want to find a sitter to care for them for a week. 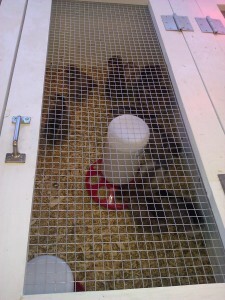 When we returned, we called around to the local feed stores to see if they still had chicks, and if so what breeds. The two major feed stores in our area are Southern States and Tractor Supply Co. I called Tractor Supply first. The lady who answered the phone knew they had chicks, but wasn’t sure of the breed or the price. I then called Southern States, and that guy was much more informative. He was able to tell me both breeds they had, the highlights of each, the age of the chicks they had, and the prices. Since Southern States was also closer, we decided to go there since the breeds were good layers, and we knew what we would get. Let me take a minute to describe the breeds of chicken we acquired. We bought 6 chickens total, 3 Aracaunas and 3 Golden Comets. The Aracauna breed is notable because they lay blue eggs. I thought that would be a really neat thing to have, and we would be enjoying something that is not commercially available. They are also supposed to be very good layers overall with a good annual output. The Golden Comet breed is not a true breed, but rather a cross of two other breeds, New Hampshire and white Plymouth Rock. They lay brown eggs, and are supposed to be phenomenal layers with large eggs that they lay quite frequently. They are also supposed to be quite docile. To be honest, we didn’t really have a lot of choice in what breeds we acquired as there aren’t a lot of places selling chicks in our area. There were some options on Craigslist, but the one post we emailed never responded back. Going through a store was easier. Still, I’m very happy with the chicks so far. They’ve been healthy, which is the most important thing. Now to the experience of us getting the chicks! 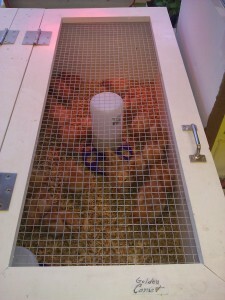 We drove to Southern States, and there was a big brooder in the front of the store. To get chicks, first we had to give the salesperson our contact information. He said that the store kept track of this in case it was discovered that something was wrong with the chicks. I didn’t love this, but what could I do? Once that was out of the way, we selected our chicks! The store had both newly hatched Aracaunas, as well as some that were a few weeks old. We went with the ones that were already a few weeks old. We figured that they’d already lived that long, which was good, and they are that much closer to laying eggs! There were only newly hatched Golden Comets, so we selected three of those. The Aracaunas were a bit more than the Golden Comets, but the salesperson gave us a discount since we were purchasing the older ones. I think the Aracaunas were retailing for $5.99 each and the Golden Comets for $2.99. To me both seemed like a good deal when you consider the output of each bird over its lifetime. 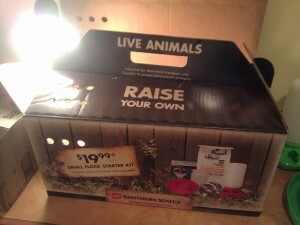 The salesperson took the birds we selected and put them in a cardboard carrying box full of shavings so we could transport the birds home. 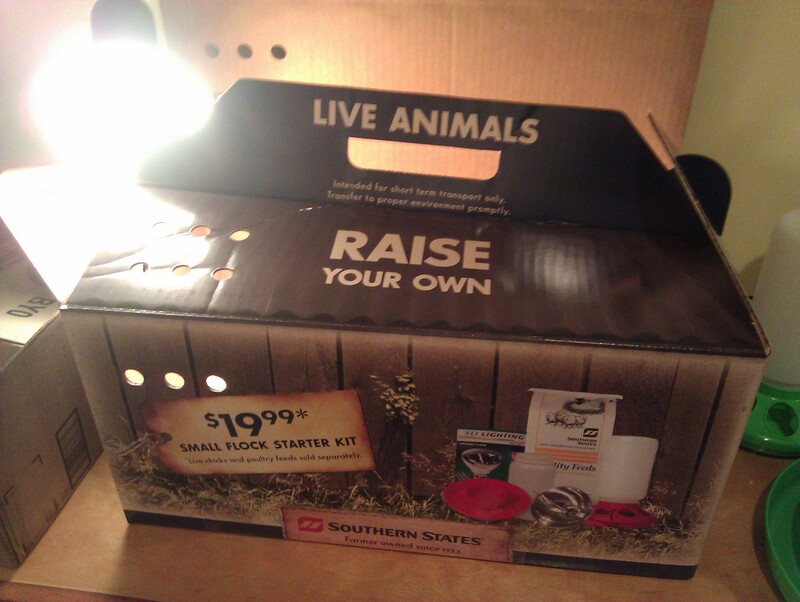 We already had purchased the chicken waterers and feeders before, so the only other thing we needed was food. 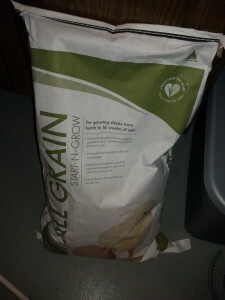 We purchased a 25 pound bag of food, and I was a little surprised when the clerk said that should last about three weeks. He wasn’t inaccurate, though. It’s been two weeks, and they’re well over halfway though that bag! As far as choices for chick food, there is medicated and non-medicated. We went with non-medicated. While the medicated means you don’t have to be as particular with the cleanliness of the brooder box, I knew we would be keeping the chick environment clean, and I prefer as little chemicals as possible. Now that we had everything we needed to get started, home we went with our chicks and their food!